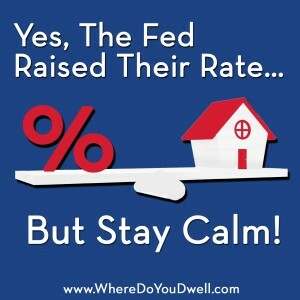 Yes, The Fed Raised Rates, But Stay Calm! The Federal Reserve raised their rate, but don’t panic! Let’s explain what the Fed rate is and how it affects the mortgage interest rate for your home. The Federal Reserve voted unanimously to increase the Federal Funds Rate by .25% from zero, where it had been for the previous seven years. However, the interest rate they increased is NOT necessarily your mortgage interest rate. Rather, the Federal Funds Rate is the interest rate at which depository institutions (banks and credit unions) lend money to other depository institutions overnight, on an uncollateralized basis. This is a SHORT-TERM interest rate between banks. Banks and other depository institutions are required by law to have a reserve balance. This is the money they can lend out to other banks, sending funds back and forth while trying to stay as close to the reserve limit to ensure proper levels. Why did they raise the rate? The reason the Fed raised the rate is because the economy is stronger, unemployment is lower, and income is rising. This is all fantastic news about the U.S. economy overall. Remember, the Fed lowered rates to zero years ago to boost the economy and to get it and the housing market moving again. 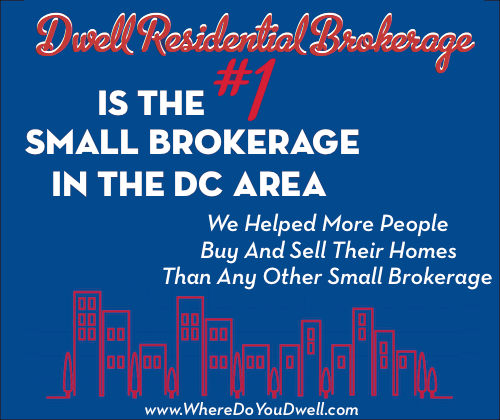 Dubbed the Great Recession, the country was in crisis mode and lower rates DID spur on buyers and sellers to revive housing, especially in the DC metro area. Now 7 years later the Fed thinks it’s time to raise rates since the economy is better. Here’s why you shouldn’t be overly concern or worried if you’ve been thinking of selling or buying in the coming year. We are here to tell you it’s still going to be a good, stable housing market for both buyers and sellers. The first rate increase is nominal. According to Trulia, an increase of 25 basis points on a $250,000 mortgage loan will raise the mortgage payment by $35. Not a huge impact. That does not change much for you! The effect of the rate increase will be gradual. Rates will not skyrocket overnight. The first date of the increase will not have a major impact on the mortgage rate. Keep in mind it does signal the likely hood of more “small bumps” by the Fed over the next one to two years. So, we should be looking at higher rates that could impact affordability several years from now—more like two to three years from now. That means now is a great time to buy a home while you can still take advantage of the lower rates. Even with the rate increase, rates will remain historically low. Even though rates will be higher in a year, they are still much, much lower than years past and will be for quite some time. Buyers in recent years have had it very good compared to previous generations of buyers!For example, the average 30-year fixed interest rate in 2005 was 5.87%; in 1995 it was 7.93%; in 1985 it was 12.43%; and in 1975 it was 9.05%. Last week, the average rate was 3.95% — so even if it inches past 4% in the coming year, that’s still an affordable rate! How does this increase change things for buyers and sellers? Buyers and sellers who are already financially stable and able to buy a home today will still be on the path of homeownership even if rates continue to increase. Most buyers will not be out of reach of buying their first home or moving up to a second or third home. Many economists predict the housing market will not reach any scary high rates that roadblocked home sales in the past. Some buyers may have to buy a less expensive home in areas where home values are already high or because their budget was already tight to begin with. We may see a rush to sell or buy initially, especially by those on the sidelines that were already challenged with the market. However, the market WILL self-adjust to a healthy momentum eventually. Why? Buyers will realize they can still afford a new home. With a sound economy, the financial situation of more households – rising employment, consumer confidence, and higher incomes – will put them in a better position to buy a home than in years past. All of these factors have been indicators of housing demand in the past and could offset any negative effects from a rate increase. Higher rates are good for buyers with savings accounts and certificate of deposits! They’ll earn more interest with their deposits, helping them to bump up their savings and motivate them to save more for a down payment. As you can see, there is no reason to push the panic button! Check out this cool video from The New York Times that’s just like an easy-to-understand tutorial on interest rates. And, please contact us at any time if you want to go over the impact you may experience as a buyer or seller in the coming months.